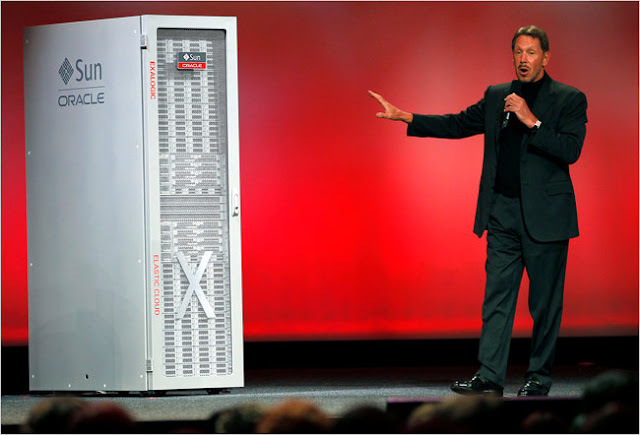 My reading of the situation is and has been for a few years now that Larry Ellison believes his industry - data software - is going through what he calls a consolidation phase, and hence his relentless buying spree. His promise to the customer has been you will get simpler, integrated software. And now, after buying Sun, he is doing what his best friend Steve Jobs has been doing for a long time now: software hardware integration. Bill Gates left the scene, but Larry never stopped competing. Larry want to do what Jobs did. He wants to surpass Microsoft in market value, and he is on his way. ArsTechnica: Oracle surprises with new Sparc chip launch: Now christened the Sparc T3, the new processor will power a collection of Solaris-based T-series servers for Oracle, and will ship in 30 days. New York Times: Google Campaign to Build Up Its Display Ads:More than 90 percent of Google’s revenue comes from text ads, and analysts say that Google’s stock is down about 17 percent this year because investors are waiting for the company’s second act. For the Unemployed Over 50, Fears of Never Working Again: Of the 14.9 million unemployed, more than 2.2 million are 55 or older .... more than a third of people not yet retired plan to work beyond age 65, compared with just 12 percent in 1995. .... “That’s what I spent my whole life in pursuit of, was security,” Ms. Reid said. “Until the last few years, I felt very secure in my job.” ..... was let go from her $80,000-a-year job. ..... Her husband worries that she isolates herself and that she does not socialize enough. ..... “A job is more than a job, you know,” Mr. Mielock said. “It’s where you fit in society.” .... how to age-proof their résumés and deflect questions about being overqualified. ..... For now, she stitches together an income by gardening for neighbors, helping fellow church members with their computers, and participating in Internet surveys for as little as $5 apiece. The Long View of China’s Currency: The renminbi itself rose 21 percent against the dollar from 2005 to 2008, and the trade deficit continued to widen. .... A stronger renminbi will help China’s people — many of whom are hungry for better living standards, to judge by the recent labor strikes — buy more goods and services, and it will also help the rest of world produce more...... economies, like battleships, tend to turn slowly ..... But exports probably matter more for American jobs anyway, given that low-end toy manufacturing in Guangdong Province isn’t moving to Alabama or Michigan. ...... $10 billion of gross domestic product equals about 80,000 jobs on average. So every extra $10 billion of goods sold to China is like its own little stimulus program. ...... not all the items on the United States’ forbidden list are truly matters of national security. TechCrunch: Zynga Moves 1 Petabyte Of Data Daily; Adds 1,000 Servers A Week:social gaming giant Zynga is one of the fastest growing tech companies of all time .... 10 percent of the world’s internet population (approximately 215 million monthly users) has played a Zynga game. .... more than 1,200 full time employees and includes 13 game studios. TechCrunch: Now that the Recession Officially Ended….Whatever Happened to that Other Shoe?